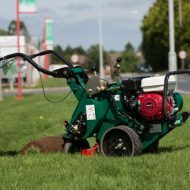 The pedestrian hollow tine aerator powered with a 3.5hp engine, it has a water ballast roller to supplement penetration improving drainage and root structure. Suitable for use through out the year with more emphasis in spring and autumn. Good results can be obtained when used in conjunction with a lawn scarifier to remove the moss and thatch in preparation for spiking .